This content was produced by the Advertising Department of WBAL. Did your son just break his arm or your daughter twist her ankle? Do you have an injury that you’ve been nursing for a while? Why not skip the emergency room by going to OrthoMarylandNOW. The Centers for Advanced Orthopaedics OrthoMaryland’s walk-in orthopaedic care service, located at Baltimore’s Quarry Lake, offers on-demand access to bone and joint specialists. Below are five reasons you should try OrthoMarylandNOW and its team of orthopaedic doctors and physician assistants. 1. They’ll treat you with a profound level of orthopedic knowledge. Open since 1925, CAO OrthoMaryland is the oldest continuously operating independent orthopaedic group in Maryland, and today it offers 11 premier orthopaedic physicians across three locations in the greater Baltimore area. Their flagship location in Baltimore at Quarry Lake has offered evening walk-in care since 2012 and recently expanded to Saturday mornings. OrthoMarylandNOW offers patients on-demand care in addition to the practice’s long-standing appointment model. 2. They’ll treat you after normal work hours. Walk-in care is available Monday through Thursday from 4:30 p.m. to 7:30 p.m. and Saturday from 9 a.m. to 12 p.m. So, for example, if your child hurts his knee in gym class, or you twist your ankle while taking the dog out after work you can go to OrthoMarylandNOW after work or school. 3. They’ll treat you with both on-demand and specialized care. Unlike at the emergency room, you’ll receive almost immediate attention from an orthopedic specialist who really understands the ins and outs of your muscles, bones, and joints. 4. They’ll also treat you to a full-service experience. OrthoMarylandNOW offers X-rays, casting and more. That means CAO OrthoMaryland’s staff can handle everything on location, making for fast, convenient treatment. 5. They’ll treat you from hurt to healed. You can book follow-up appointments right after your initial consult at OrthoMarylandNOW. Since the practice offers three locations, nine orthopaedic surgeons and two physiatrists and a large team of physician assistants and physical therapists who specialize in orthopaedics, you’ll enjoy not only the convenience of plenty of options, but also the highest level of competence. For more than 93 years, The Centers for Advanced Orthopaedics OrthoMaryland has been committed to providing patients comprehensive orthopaedic care. Its team of orthopaedic doctors, physician assistants and physical therapists treat whole families, from pediatric to adult patients, and cover everything from general to subspecialty orthopaedic care, as well as physical medicine and rehabilitation. 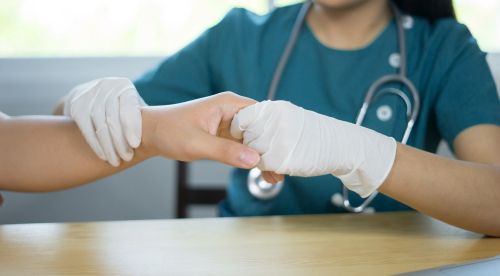 The practice’s walk-in care service, OrthoMarylandNOW, located at Baltimore’s Quarry Lake, allows its team to serve patients quickly, at the times people need help the most.